This is a continuation from an earlier post about the issue I had with clearing my ears from changes in air pressure during pilot training. To better understand this post, you should know about how winds affect takeoffs and landings and how pilots name landing strips. A very important piece of information about a landing strip or runway has to do with the wind. Will the wind be ideal, that is, coming at you as a headwind? Or will it be a tail wind, causing you to take up more runway to take off or land? Perhaps it is a cross wind that wants to blow you off the runway to one side? Runways are usually designed to run along the prevailing winds. But winds can change from day to day or minute to minute. Another important item is what will it look like to you as you approach it? If I am coming from the south, for instance, is it straight on to me or am I approaching it from one side? Because of this, runways are named for the direction they run. If they run exactly east to west or west to east, it will be runway 09 / 27. This refers to the points of the compass of 90 degrees or its opposite, 270 degrees. 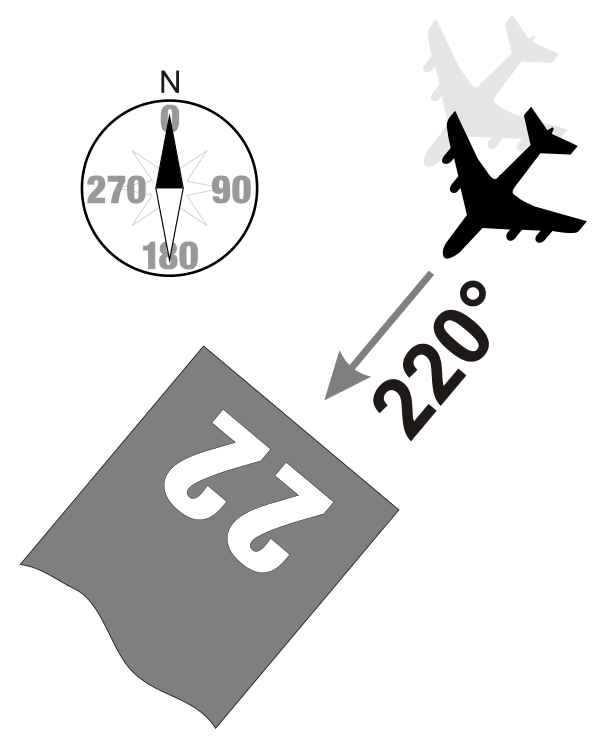 If you are landing in the direction of southwest, it could be runway 22 as shown in the illustration herein from http://en.wikipedia.org/wiki/Runway. Landing in the other direction, 180 degrees opposite, would be runway 04. If winds are from the northwest and you are landing on runway 31, a headwind should be there to make your takeoff or landing easier. The other bit of aeronautical knowledge important to this tale is how one puts a T-38 on the ground safely. Each aircraft lands a little differently, but all essentially the same. You want to fly a few feet off the ground, hopefully over a runway, lower the speed, and stall out the aircraft (destroy the lift of the wings) so the wheels touch. This is done by pulling back on the controls as the aircraft slows. Most wings are designed to increase the amount of lift as the aircraft pitches up and slows down, to a point, and then there is no lift. 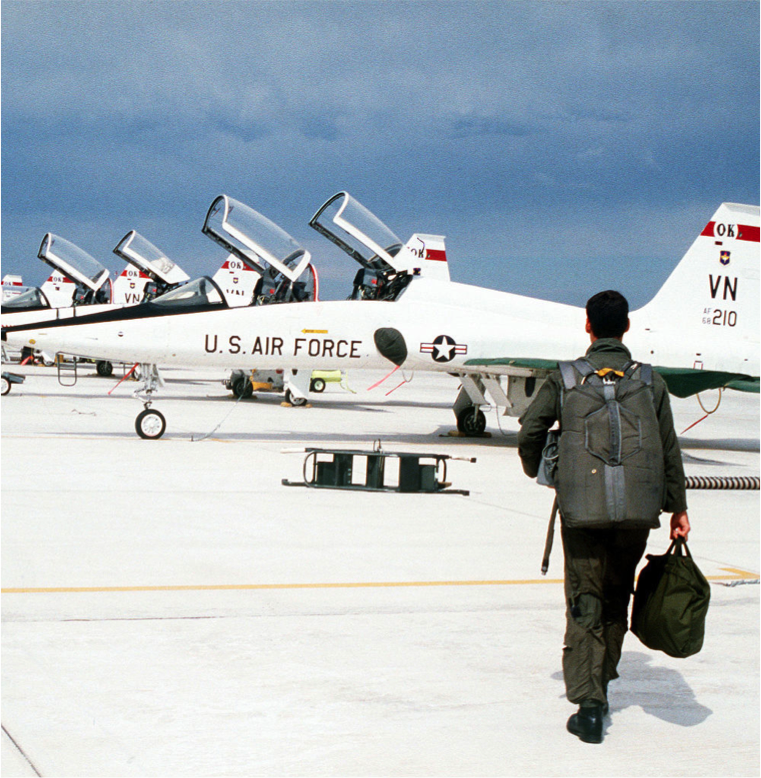 The T-38 landing speed is around 160 nautical miles per hour. You get to that landing point on the ground, usually, by flying a box pattern around the runway. The T-38 approaches the runway in the direction of landing at a screaming 300 nautical miles per hour at 1500 feet above the ground. (A nautical mile is 6000 feet as opposed to a statute mile which is 5,280 feet.) Midway along the runway, the pilot banks sharply and pulls the stick to turn the aircraft to fly the opposite direction and reduce speed. In the final turn to align with the runway, the pilot loses altitude and speed by pulling throttles back and skipping along the edge of the aircraft stall. Too much stall and the aircraft no longer flies, it falls. Very quickly. Many T-38s have crashed in this manner. In the final turn, you pull back on the stick feeling for the wing to start to stall. You feel a vibration that most describe as “ants dancing on the wings”. If you pull back too much you feel the “elephants dancing on the wings” and your best bet is to roll your wings level and hit your afterburners because you are about to drop out of the sky and die if you don’t. There is a lot more to it, but suffice to say, it is a time of intense concentration on the part of the pilot to ensure a safe landing. So, on with the story. For some reason unknown to me, as I graduated to the supersonic T-38 and switched to wrestling the Talon around the sky, I had much more trouble with clearing my left ear. On occasion, I would have to actually declare an emergency to get priority for landing. Embarrassing. On one of those occasions, at the very same time as me, my fellow student, we will call him Stu, found himself in a similarly embarrassing situation. That’s why we were called “students”, right? Stu’s landing gear would not come up on the first try. The procedure says, don’t try again, just land. He tried again and his landing gear was now in an unknown situation. As it turned out, he landed safely. But not without first declaring an emergency and being a part of this tale. As Fate would have it, in the few seconds between when I declared my emergency and Stu declared his, the winds shifted and the runway changed. We had been on runway 13, when the winds shifted, it was now runway 31. Upon realizing the situation at the last minute, we both broke to the right as we learned in ground school. Stu, unfortunately, found himself in the more interesting position of being pointed straight at the Columbus Air Force Base water tower as he pulled out of his avoidance turn. In the end, pilots and controllers scrambled and we both landed OK with only a good story to tell. When I got home that night, my wife told me that the most terrible thing had happened to her friend that day. Her friend was the wife of a student air traffic controller who had made the awful mistake of vectoring two students towards each other over the runway. He was very upset. His wife was very upset. “Somebody could have died!” she said.